A beautiful soup to kick-off any holiday feast, this is one of my favorites. The first time I tasted butternut squash soup it was served in those tiny cups as an hors d’oeuvre at a wedding. Cute idea and I loved the soup, but oh so unsatisfying! I couldn’t get enough from those little cups. I wanted a big bowl and the server was tired of me chasing after him with his tray of deliciousness. Soon enough, I was making it at home for my family. For my first attempts, I made curried butternut squash soup. Ellie Krieger has a really good recipe in her The Food You Crave cookbook. This time I wanted to try a version that combined the fresh squash with a little sweetness. Since we are in the middle of autumn, I thought apples just picked from the orchard would be the ideal ingredient to achieve the sweetness I was looking for. This soup is so creamy but nary a drop of cream in sight. The salty crunch of the crisped prosciutto on top is sensational. If you don’t own an immersion blender I highly recommend one for recipes like this. An immersion blender lets you take the blender to the soup, not the soup to the blender. Heat the oil and butter in large heavy bottomed stock pot. Add the onion, carrots and apple. Cook, stirring frequently until they begin to soften. Add the garlic and sauté until fragrant, about a minute. Add the chopped rosemary, squash and chicken stock. Season with salt and pepper to taste. Give a good stir and bring to a boil. Reduce to a simmer and allow to cook covered for about 30 minutes or until the squash is nice and soft. Shut off the heat and using your immersion blender, blend the soup until it’s velvety smooth. If using a blender, be sure to follow the instructions for blending hot ingredients. Place the blended soup back on the stove at medium-low and add the cider vinegar one tbsp at a time. After the first addition of vinegar, sprinkle with some salt, stir and taste. Add the second tbsp of vinegar, stir and taste. Reseason with salt as needed. 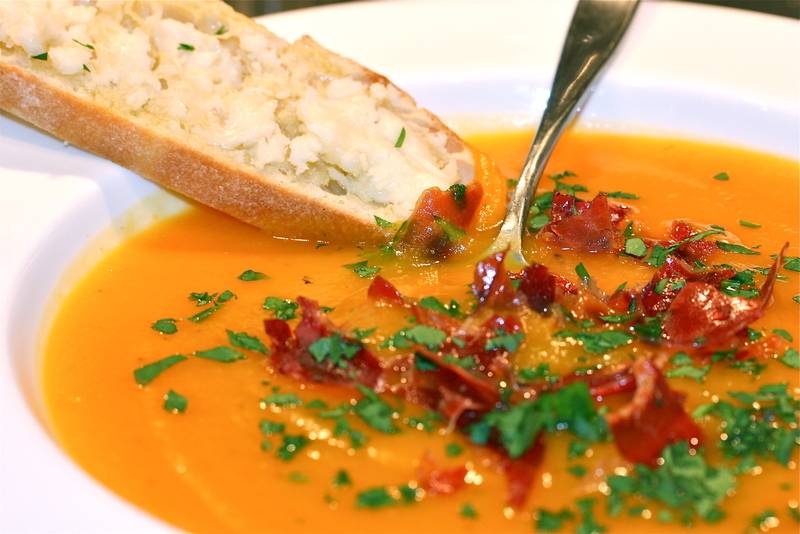 The soup is delicious alone, but to serve with the prosciutto, preheat your oven to 375 degrees. Line a sheet pan with a piece of aluminum foil. Lay the slices of prosciutto on the foil and bake for about 10 minutes or until crisp. The prosciutto will crisp up a little more as it cools. Break the prosciutto up and sprinkle over each bowl of soup along with some chopped parsley. Enjoy! * A hunk of rustic bread is perfect with this. I have schmeared my bread in the photo above with a little taleggio cheese. Taleggio is a semi-soft aromatic cow’s milk cheese from Italy’s Lombardy region. It’s one of our favorites.